Well done, you win the right to compete next year too! The final GLOSS of the 2015 series held by MV at Morden Park was a wet and breezy affair with the temperature at a steady 14c throughout. Nobody, not even the wild life, was tempted by the paddling pool adjacent to the capacious car park. However this did not detract intrepid GLOSSites from trekking from all over the Greater London region to the area, which had only been used once before for a Park Race. The planner (Graham Sutton) made the most of the grassy parkland (some of nicely mown) with patches and strips of woodland and one mini-hill (#12). On occasions there was the need to watch out for uncrossable fences and carefully read control descriptions, for example at #6. The event results are available here. The detailed GLOSS scoring results are here. SLOW had a good lead going into the event and were not beaten – so were crowned champions. 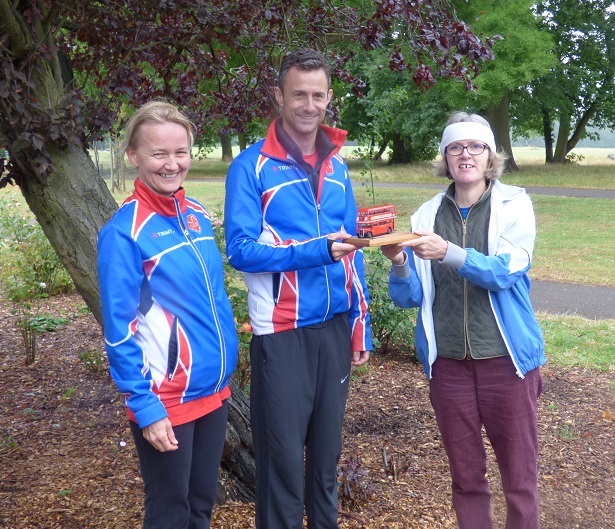 Catherine Galvin, the GLOSS 2015 series co-ordinator, presented the London Bus Trophy, which had travelled down that morning from leafy Hertfordshire, to SLOW represented by a thrilled Paul Couldridge and Dorte Torpe Hansen. 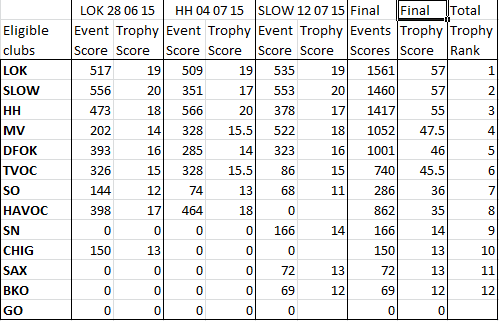 SLOW were worthy series winners top scoring in a majority of the events. Only 11 months now to wait to the start of the 2016 GLOSS series with a LOK event on Sunday, 26 June 2016 – venue TBC. This year saw the introduction of a revamped handicapping system based on BOF ranking points. Expect further refinements next year. Any comments on the scoring system are welcome. 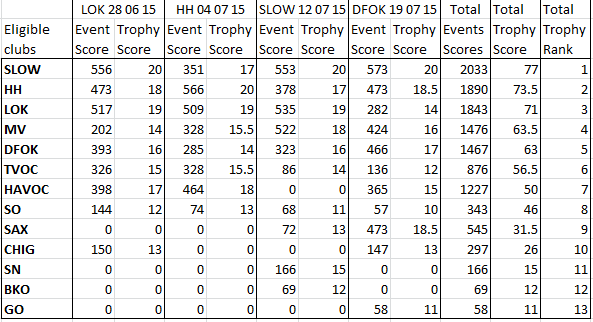 The results of DFOK’s Shooters Hill GLOSS on 19th July are here. The detailed club results are now available here. Another sunny (22c) if breezy summer’s morning at Shooters Hill in South East London. Last used for Frolics, the previous name for the GLOSS series, in 2012, this time it was absent the surface-to-air missiles that had been installed for the Olympics. Shooters Hill is the highest point in South London at 132 metres (432 feet). The registration and finish afforded magnificent view up Hill to the café. 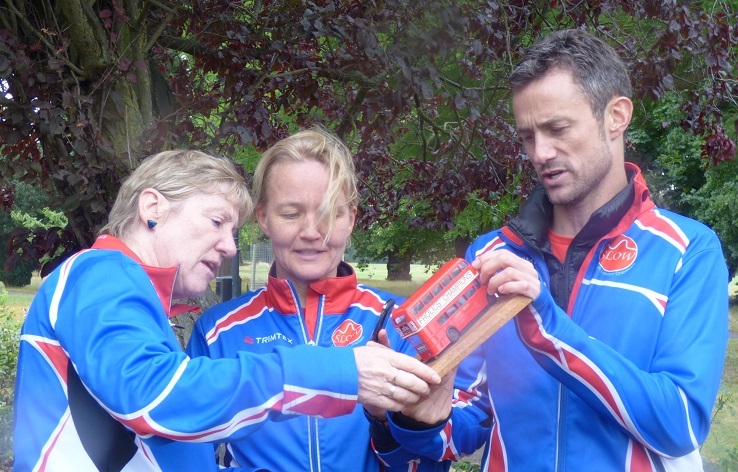 There was a quality turnout with well-ranked orienteers seeking to squeeze in that extra bit of forest orienteering before the Scottish Six Days and the World Championships in 2 weeks time. And all but one of the clubs eligible for the GLOSS trophy (SN) were represented, including GO for the first time in the 2015 series. The wood, one of the few remaining areas of ancient deciduous forest, was luxuriously dense requiring concentration to keep in touch with the map. Some competent orienteers lost out materially particularly at controls 11 and 12 on the wooded side of the hill. SAX performed strongly for the first time with 9 runners on the GLOSS course, just 2 short of SLOW’s 12. The series results to date are below. Remember that the top 4 club scores count. The final GLOSS is next week at Morden Park, a beautiful park dotted with mature trees, useful facilities, and some features of historical interest. …. The results of SLOW’s Putney Heath GLOSS on 11th July are here. The detailed club results are now available here. Cooler overcast weather (18C) did not dampen turnout at Putney Heath, the site of many sporting duels in centuries past. 10 clubs were represented including SAX, BKO and SN for the first time but HAVOC on this occasion preferred the Stragglers’ Relays out in Essex. The historic Telegraph pub opened early for registration. In the competition area you would not have known that you were in central London given the stillness on the heath and in the woods. The GLOSS course was moderately tricky for those not paying 100% attention. Competition was fierce with SLOW pipping LOK on home ground by 18 points. The only other team fielding a complete team, MV, came third 13 points behind LOK. Well done to Paul Couldridge of SLOW for being the quickest around the 3.6km course in just under 20 minutes and being top scorer on handicap despite having the most penal handicapping factor in the field. Next week the series visits Shooters Hill in South East London, reputedly taking its name from the practice of archery there. Results of HH’s Cassiobury Park GLOSS on 4th July are here. The detailed club results are now available here. The Lefevre intergenerational family combo have kept DFOK in the hunt, despite them being a long way from home. Sunny, hot balmy weather (23C when I was running according to my Garmin Forerunner) was accompanied by a similar turnout to the previous Sunday at Osterley of just under 70 on the GLOSS / extension course. The previous night’s dramatic thunderstorms wiped out the originally planned control 9 on the Orange and made for shin-high splashing on the GLOSS course along a narrow path through shoulder high nettles to woodland adjacent to the River Gade (which runs parallel at this point to the Grade Union Canal). 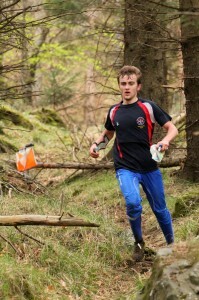 Only one of the few competitors not foxed by a complex area of former quarry workings (control 10), Walther Rahbek, chair of the Danish Orienteering Federation and visiting LOK member, turned in the quickest time on the GLOSS course. His age handicap counteracting his Very Good status keeps his 4 minutes raw winning time adjusted up to still be #1 placed finisher. 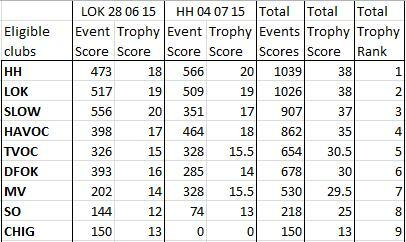 Results of LOK’s Osterley Park GLOSS on 29th June here, including GLOSS handicap times and positions. 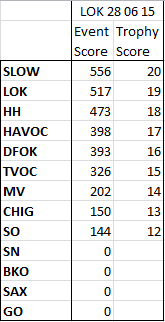 The new handicap system based on BOF rankings has brought up some interesting results, with the speedy youth of SLOW (and therefore inexperience and fewer ranking points) out-gunning the experience, guile (and heavy handicaps) of LOK and HH. Registration/ download, Start and Finish etc under a National Trust gazebo right in front of the 18th century ‘palace of palaces’ by architect and designer Robert Adam for the Child family to entertain and impress their friends and clients. There was a steady flow of competitors and the weather was OK until the heavens opened around 1200ish. Thanks to the National Trust @ http://www.nationaltrust.org.uk/osterley-park/ for providing the venue surrounded by gardens, park and farmland, Osterley is one of the last surviving country estates in London. Registration/ download, Start and Finish etc under a National Trust gazebo right in front of the 18th century ‘palace of palaces’ (as once described by Horace Walpole). Today the house is presented as it would have looked in the 1780s; enter the house as the family’s guests would have via the impressive stone steps leading up to the portico. Stroll through the colourful formal gardens, transformed during a six year long project from an overgrown wilderness back to their 18th century grandeur of herbaceous borders, roses and ornamental vegetables beds. Look out for the original Robert Adam summer house full of lemon trees and highly scented shrubs.